In rod form this glass is a very pretty pale aqua with a slightly more greenish tint than Effetre pale aqua. 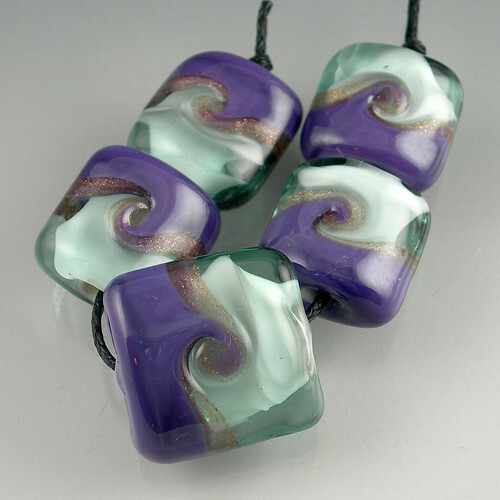 There are really no surprises when melting it and it stays true to color in bead form. I didn't bother to do any reactive testing with silver, sulfured glasses and the like because I was really most interested in the how the glass itself works up, although I bet it would be gorgeous with some fine silver. It is stiff. Very stiff. I sometimes like to use Effetre pale aqua as an encasing glass, but I would not do the same with the Reichenbach. It took too long to melt and never got nice and buttery, which is a quality I like for encasing. It took a fair amount of heat to get it malleable enough to press. 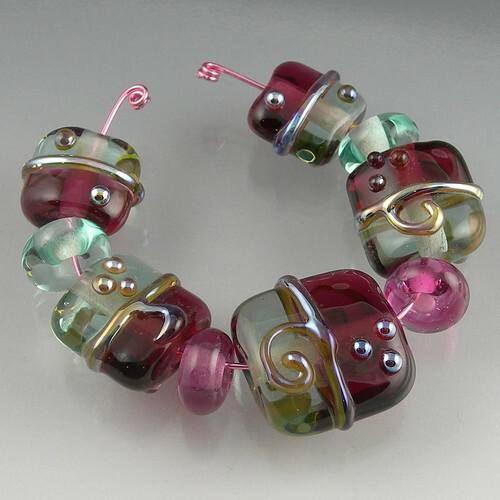 Admittedly, it took me three attempts to get enough heat in the bead to squish it cleanly - which is a tricky balancing act when pairing it with heat sensitive pinks and purple like I did. The color is sharp and crystal clear like most of the transparent Reichenbach glass I have worked with. It did not bubble or scum for me at all and retained is beautiful clarity though all the tormenting I gave it. It is a very pretty color, but at nearly 3 times the price of its Effetre counterpart, I cannot justify making it a staple in my palette. Perhaps if it was a little more dense and not so pale and worked up a bit softer I would reconsider. 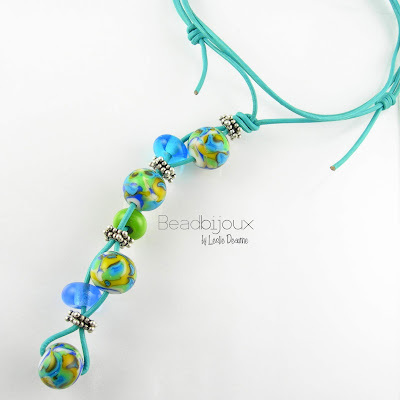 These beads currently up for sale on eBay if interested.